Peel away the purple colored bracts to expose the 'hand' of florets. Cut the florets just above the point where they are joined to the axil, separate them and put them in the lemon-water. Continue doing this until the bracts are more white than purple-pink and don't peel away easily. Cut the conical tip or immature inflorescence off the central stem or axil, and slice it in half lengthwise. This is the only part that will visibly ooze white sticky sap. Immerse it in the lemon-water, along with the rest of the florets. Let sit overnight or for at least 4 hours. I kept mine in the refrigerator but it's not necessary. Drain the florets and prepare a fresh solution of water and lemon juice. 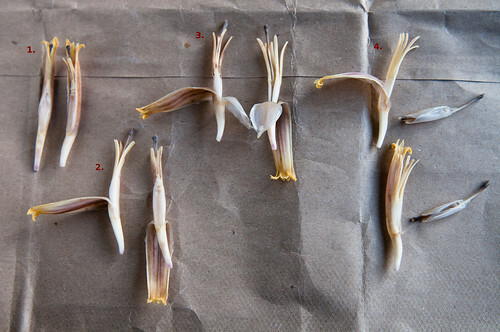 And here comes the most tedious part of prepping banana blossoms: removing the dark-tipped stigma from mature flowers along with the translucent calyx that covers it. But it goes by quickly if you have some good music playing. Four-step easy way to do this! hold the florets with their inner side facing you. open up the outermost petal that almost encloses the entire floret. tug at the stigma (often, mistakenly called the stamen) and pull it away from the outermost petal, separating the translucent calyx from the whorl. pluck the stigma and calyx from the floret and discard. Soak floret in lemon-water until you are ready to chop. Chop the florets as fine as you like. I prefer to chop them into ½in pieces and add them to the fresh pot of lemon-water. Slice the conical tip into ½in thin slices and add to the lemon-water. Let sit for about an hour. 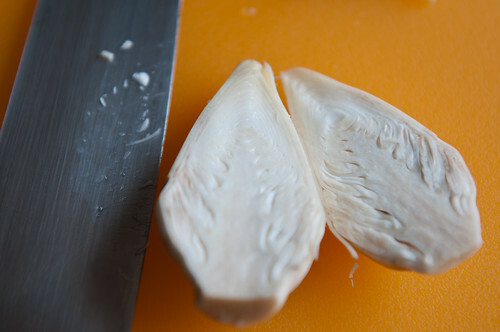 Drain chopped florets and use in your cooking as you would have, had you oiled your hands or worn gloves. Three of my cousins—all far more experienced than me—as well as my niece, all in India, were helping me figure out how to capture the flavors of my childhood, with this banana blossom. My cousins had always chopped the florets and then soaked them overnight in buttermilk. The Saraswat cooking Bible, Rasachandrika, concurred. But this inflorescence is used widely in South-East Asian cuisines and not one of them mentioned buttermilk. They did, however, suggest soaking in lemon-water. Aha! That was easier for me than soaking them in cultured buttermilk or thinned-out yogurt. And guess what? No harm done, only gains! I hate to think of the damage that oil and sticky sap on my fingers would have done to my camera! Most recipes indicate that soaking in buttermilk or lemon-water is to prevent blackening of the florets. They wouldn't need to be soaked overnight if that were the case. I'd like to hazard a guess and suggest instead that this step is essential as the acidic solution neutralizes the sticky sap. There are many ways to cook these banana florets. Usili is very popular in Southern Indian cuisine, as are vadas. It is used in sambars, too. I intend to try these recipes in the future but, for now, I was more focused on recreating that very kelfulachi bhaji that my mother made. I am partial to Maharashtrian cuisine, especially when it comes to vegetable sides. The veggies aren't cooked to death, and the seasoning is often a simple yet potent phodni, that allows the true flavor of the vegetables to shine through. Prep the banana blossom as described above. You will need to start ahead by at least 4 hours, if not overnight. Heat oil in a kadhai and when it shimmers, add black mustard seeds. When they turn grey and start to pop, add asafetida. Add Thai chiles and cover. Drain chopped banana flowers and add along with salt and 2 tsp jaggery. Toss until combined, and add 1/4 cup water, if required. Add cooked kale vatane and mix well. Cover and cook on medium-low until the banana flowers are cooked through. They will soften as they cook and absorb the flavors and will no longer taste as astringent. About 15-20 minutes. Stir periodically and, if necessary, add some more water. Once cooked, adjust seasonings and add more jaggery, if required. 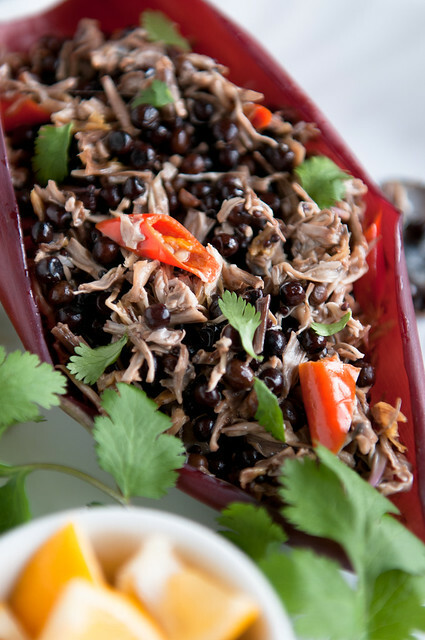 Add lemon juice, garnish with cilantro and coconut, if using. Serve with hot rotis. Kale vatane may or may not be available at your Indian grocery store. I had some in stock from my last visit to India. 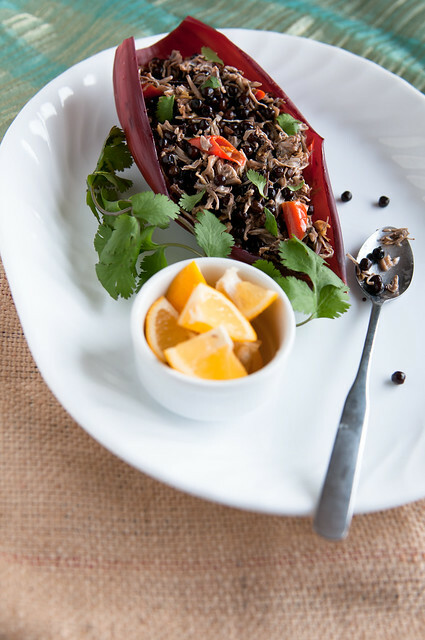 Puy lentils are a good substitute, only because they hold their shape and do not become overly mushy like brown lentils. You could substitute with a bean of your choice, too. 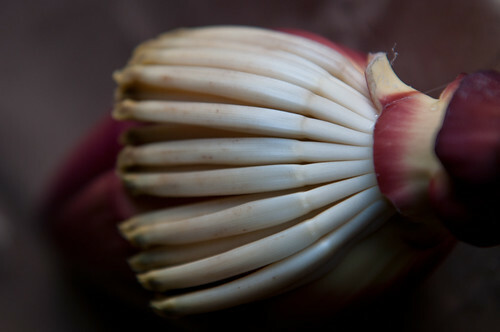 Banana flowers are quite astringent when raw and retain some of that bite even when cooked. Medha found this less astringent than baby spinach and quite liked the taste. I was rather surprised as this is mostly an acquired taste. Prepping banana flower is the key. I have kept the soaked flowers in my refrigerator for a couple of days without any problems before I cleaned them by removing the stigma and calyx. I have been high on bananas. 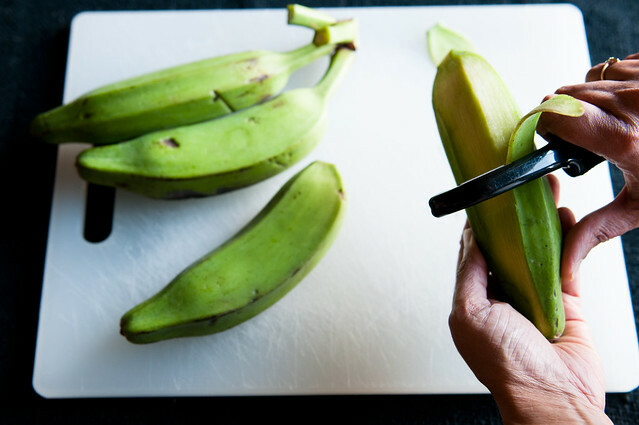 My last column for Whole Foods Market Cooking Blog was also about bananas—green bananas, often mistakenly called plantains. Again, it's a very simple recipe! It's been a while since I have participated in any blogger events. For the most part, I just miss the deadline because of something called real life! But I could not resist sending these Maharashtrian flavors to Preeti's Ruchira Giveaway. I am also sending this to Manasi's very first event, I Must Make That! Tomorrow, February 13, it will be a year since my friend Raji passed away. I plan to celebrate her life by cooking and posting something from her blog within this next week. If you enjoyed Raji's charm and quick wit, consider joining me so that together we can remember a beautiful person who touched our lives. I remember cooking with banana blossom a very long time ago. I had plucked it from the garden without being too careful to protect my clothes. Once the white dupatta and salwar came out of the washing it had black stains all over! Quite the disaster, I tell you. I cook with green bananas often. That too stains the fingers. I just rub a little lime juice (just like you did for the flower!) on my hands and that takes care of the stains! Are you topped up on kaale vatane from D's visit home? I am almost out. They can be substituted very well with kala chana also - I find the tastes and textures very similar. Pretty simple and clean flavors. In Koli cuisine they load this bhaaji with garam masala and I don't like heavily spiced stuff. Yours sounds better. Manisha I was also saying to Preeti of Isingcakes about remembering Raji. Lets post and I am making Brinji in her memory because you had posted about it and that's the way I remember her best from the pics you posted here of your Delhi meet up. Now this is such a beautiful presentation! I have eaten mochar dalna/ghoto as a child at my bong kakimas' and mashi' but never at my mavshis' etc. 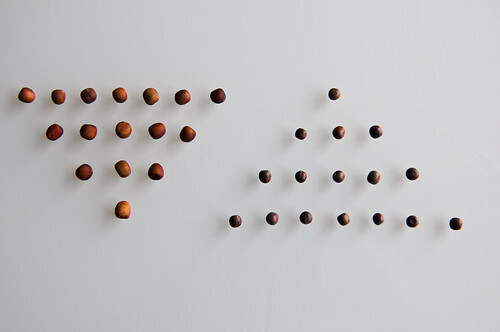 I love how you have explained about the whole process of cleaning, peeling, separating and sorting. This is a unique entry indeed for the giveaway! I will prepare something to celebrate Miri's life as well. Just made the vadas with these. Loved the blossom pictures. One could also use oil ( any type of cooking oil) on the hands to keep it free from the staining serum. Lemon juice!! no oil. That sounds more promising and may be I will give them a try. Love this post Manisha. I remember how ma and my grandmas would take out the stigma for the whole bunch of florets in that layer at one go. I could never do that. (And that was the part I told we ate :) that little white part). In Bengal, they are chopped and soaked in salt water I think. Never in anything acidic. Then pressure cooked for most of the recipes. I never had it cooked this way. Looks and sounds delicious! Green banana is cooked often... more than the banana blossom. One year for Raji...praying for her family. As an aside, we used to call the separation of stigma as Kavle and Chimnya. Remove the crows and keeps the sparrows(?) also a pinch or half teaspoon of Kala/goda masala was added to the recipe. What a lovely post,the pictures, the recipe! A must try recipe. 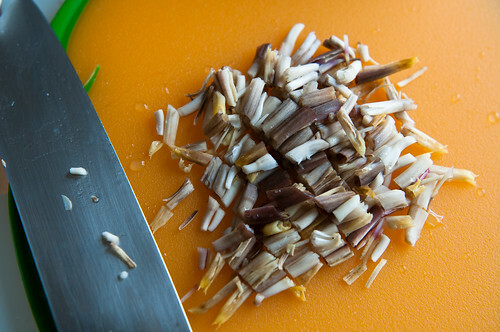 I have always made it this way ....grind coarse some coconut,shallots,red chillies and jeera. Season fry the flower chopped, add paste cover cook 10 minutes. Must try your way now. The kale vatane are from a previous visit. I have kala chana and will try using that instead. Thanks! notyet100, it is, thanks! You should try it! 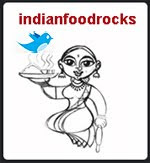 Anjali, adding garam / goda / kala masala are variations of this basic dish. And, thank you! For joining me in celebrating Raji! Isingcakes, kiti til-gul khalale? Just kidding! I'm glad you reminded me of mochar ghonto. That's on my must-try list, too! I'm so glad you think it's worthy of your event. And thank you for joining me to celebrate Raji! Soma, I had to do it several times to make sure it wasn't just a fluke that the banana blossom did not bleed sap! Entire hand of florets in one go? Now that's superhuman! I can't compete with Grandma there! I have to do it floret by floret! A lot of recipes call for pressure cooking the florets. I'm not sure why. I like them to have a slight crunch instead of pure mush. Make something for Raji, if you can? Thanks! Abhi, what? Kavle ani chimnya?! This is the first time I've heard that! Very amusing! And, yes, adding goda masala is a variation of this recipe. Mandira, that's interesting that you soak the florets in turmeric water. What do you think that does to the florets? Do you have a recipe for mochar ghonto on your blog? Poornima, I like the idea of a spicy coconut paste! Now I have one more way to make it! Thank you! But if I slow down, as you ask me to, I will waste more water! :-) I think I will try it next time. I make green banana erriseri - very good it is too! This sounds delish. I don't think I've ever had banana blossoms before, not even in India. Curious how they taste. And it looks very pretty too! Nags, dang! I hope you do try it out. It's really not as tedious or tiresome as they make it out to be! Anita, you could peel them in a pot of water, holding the bananas under the water, maybe? I love erisseri! Gabi, it is an acquired taste as the blossoms are very astringent. But this recipes balances that with the jaggery and lemon juice. I haven't had the raw salad but the next time I am in Thailand (in my dreams!) or in Viet Nam, I intend to try it their banana blossom salad.